Whether you're a family person, a working professional or both, the Birch II in Origins by Cranston will make a lasting impression on you. Timeless finishes will draw you into this two bedroom, two bathroom unit, located in the exquisite neighbourhood of Cranston. 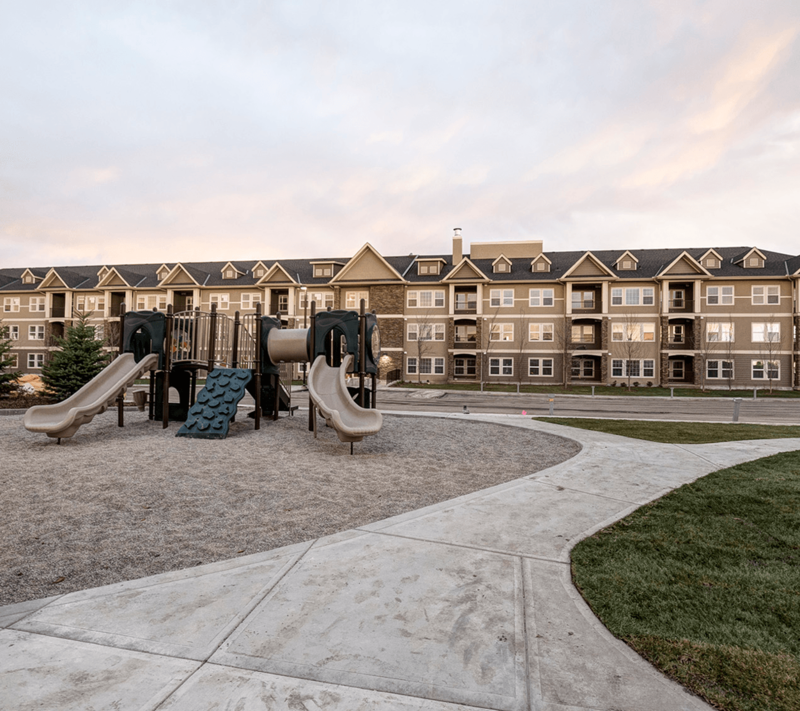 Situated on the south-east side of Calgary, this area is accessible by many main commuter routes. Not only is Origins by Cranston suburbanite friendly, it’s surrounded by an abundance of amenities. Located at #207, 200 Cranfield Common SE the Birch II promises 928 square feet of homey comfort and flawless design features. 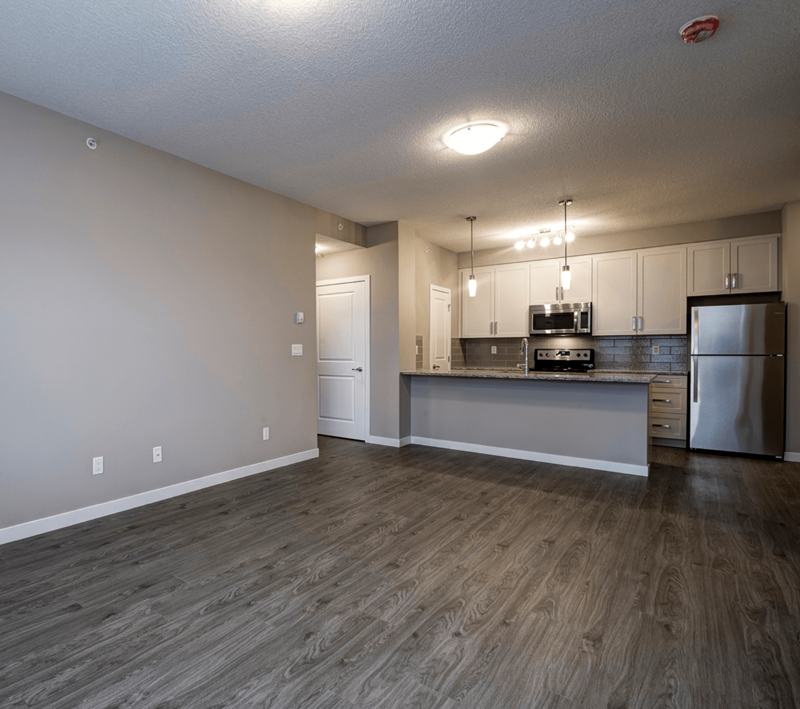 The interior of this unit boasts a light, bright living space (courtesy of its south facing windows), as well as 9' ceilings and a complimentary colour palette that's sure to match well with any decor. The kitchen is well suited for any lifestyle with ample white quartz counter space, a large pantry for storing away everyday items, and an eat-in island. 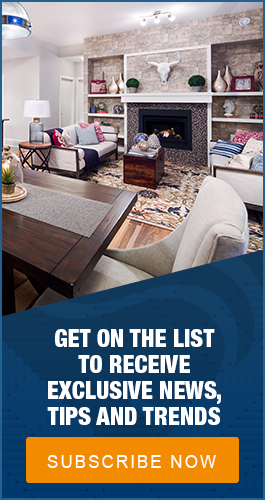 You will enjoy the beautiful chocolate shaker style cabinets, classic Moen faucets, and upscale energy-efficient stainless steel appliances - they won’t leave you disappointed! Contemporary, elegant and functional, making dinner in this designer kitchen is sure to be a breeze. Throughout the home, rich modern vinyl plank flooring flows through the kitchen, dining, and living areas. The open concept living room creates a sense of connection between the kitchen and dining area, making it the perfect layout for visiting with friends and family. You can also look forward to your very own in-suite Whirlpool washer and dryer - tucked neatly away from the main living area. This means convenience will be at your fingertips when it comes to keeping up on laundry. The Birch II features two large bedrooms, with one providing a large walk-through closet leading to a contemporary three-piece ensuite featuring a generous full-size shower/tub combo and linen closet. Both bedrooms have plush carpeting, creating that essential cozy feel in these two sleep spaces. Both ensuite and main bathrooms feature sparkling porcelain tile and high-end finishes making them cohesive with the rest of this stylish unit. #207 has only one neighbour, making it well suited for someone who wants an upgrade in their personal space. It also features vast greenery views, compliments of the south facing terrace just off the main living space. For people who have children, Origins at Cranston has its very own centrally located park and playground area, which is perfect for burning off energy on the weekend or after school. With the Bow River and Fish Creek Park just minutes away, Cranston is the perfect walking and biking hub for indulging in the outdoors. The community also features many schools, making it the perfect place for families to call their own. In fact, the public K-3 elementary, Cranston School, is only a short walk away so there's no busing your young kids to school. Better yet, the brand new Dr. George Stanley school (Gr 4-8), is only one block south. If accessible shopping is one of your main concerns, you can venture to the Shawnessy Shopping Centre, just minutes away. 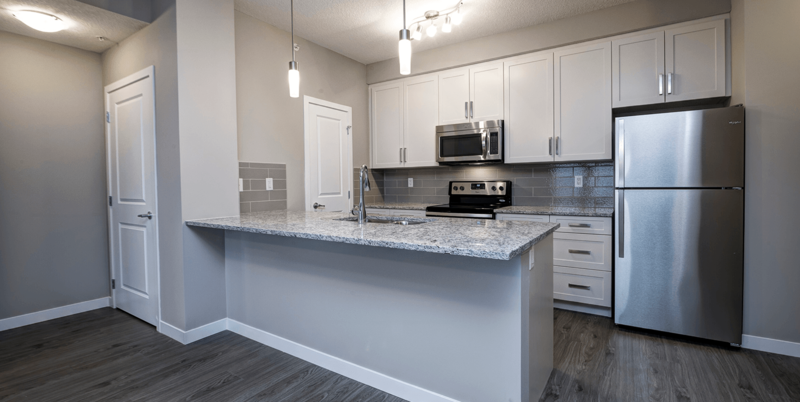 This condo is adjacent to Cranston's popular commercial centre featuring a Sobeys, Good Earth Cafe, and other trendy neighbourhood shops and services. Lastly, for those who commute to work every day, Origins at Cranston is easily accessible by Deerfoot Trail, Highway 22x and Stoney Trail. As for bus routes, this community has many Calgary Transit stops that lead all over the city. If you want it all in Cranston, this condo is available immediately! With the modest purchase price of just $270,000, the Birch II is sure to move quickly. Contact us today to learn more or stop by for a bird's eye view of this beautiful unit.